in Congress Intrernational sur le genre Testudo - Proceedings (March 7-10, 2001) pages 78 - 108 he elevates T. terrestris to a full species. and splits the middle eastern Testudo graeca to 8 species. "Golden Greeks" are a mix of all of these species. This care sheet is intended only to cover the general care of this species. Ongoing research to best develop a maintenance plan for whichever species you are caring for is essential. In the summer of 2001 a new tortoise appeared on the American market. While it was obvious that this was a Testudo of some variety, depending whether you are a “splitter” or a “lumper”, it was declared a Testudo graeca or Testudo graeca ibera1 or, depending upon your taxonomist of choice, Testudo graeca terrestris or Testudo graeca floweri. In other words, little was known about them other than that they had a very light colored shell and that a mask was evident on darker skinned specimens. They became known in the market as “Golden Greeks”. Until these animals are examined by taxonomists and their findings peer reviewed the actual species/ subspecies designation of Golden Greeks will most likely remain in question. Initial examinations by taxonomists identify the species as probable Testudo graeca terrestris. This is supported by the probable locale data from the early shipments and confiscations of a Lebanon or Jordan point of origin. These are not Testudo graeca of the classic North African form. While many of them share the typical T. graeca mask or lighter skin, which may lead people to think this, the morphology of the shell (in particular the first vertebral scute and the marginals) and the head are totally dissimilar. The initial importations of these animals further confused the issue by also containing specimens fully as large as a typical T. ibera and including highly contrasting animals of more typical coloration. ( T. ibera anamurensis) It was only after the animals continued to arrive and one presumes collection sites drifted and they were more difficult to locate that the imported specimens steadily became smaller and smaller until they reached a size where they were sometimes called “Dwarf Greeks or “Dwarf Golden Greeks”. Many of these “dwarf” specimens also have a more typical T. ibera coloration and all still share the same basic morphometrics as the large "golden specimens. Acceptance of these animals as simply a color / size variant of T. ibera has led many individuals to care for them in a manner that would be acceptable for the Mediterranean Spur Thigh Tortoises that we traditionally see. Doing so is a mistake, one that could result in fatal consequences. There are T. ibera2 that closely resemble this coloration in a general way though they do not attain the "golden" color or pattern but the care is very different for Golden Greeks than for T. ibera. As indicated by their light coloration, Golden Greeks are likely to originate from a sandy area, much like Testudo klenimanni. Evolving a darker coloration in such an area would make a tortoise easy prey for any predator, in addition the lighter shell coloration is indicative of an area that reaches seasonally high temperatures where a dark shell would be an unwelcome heat sink. HOUSING: Golden Greeks tend to bury themselves in the topsoil or under the base of clumps of grass, regardless of being maintained indoors or out this ability to hide should be duplicated. Unfortunately if they are being maintained in an area with a damp substrate this tendency to dig a "pad" results in them sitting in a very high humidity location for long periods of time. Upon exposure to a humid environment, even if warm, many of these tortoises develop Upper Respiratory Tract Disease (URTD) and rapidly decline. To avoid this Golden Greeks should be housed in a dry, warm environment with low ambient humidity. 30-50% This must be taken into consideration when arranging housing for them. While most species of tortoises respond well and do much better with outdoor maintenance, this variant does better in indoor accommodations unless they are being maintained in a low humidity climatic zone or special consideration is given to providing a substrate that does not hold moisture. HOUSING GOLDEN GREEKS INDOORS: The most useful form of indoor accommodation for Golden Greek Tortoises consists of a “turtle table” (How to Build an Indoor Land Turtle Table by David T. Kirkpatrick Ph.D). To all appearances this looks like a bookshelf unit flipped onto its back. A reasonable size for a very small specimen is 2 foot by 3 foot, (60 cm by 90 cm). As the animal grows the size of this habitat should be increased. For an adult Golden Greek tortoise 6 inches (15 cm) or more in length the indoor habitat should be at least 4 foot by 2 foot, (120 cm by 60 cm). Into the bottom of this “turtle table” holes can be cut to allow for the sinking of food, water and eventually nesting containers flush with the surface for easier animal access. The water dish in the habitat should be large enough to allow the tortoise to soak in it if it wishes - it must also be shallow enough to protect from drowning, small photographic developing trays work well for this purpose. As a substrate in the dry portion of the environment grass hay serves admirably. Grass hay may provide supplemental food as well as providing a burrowing substrate that does not “hold” humidity. As an alternative to this topsoil mixed with clean sand may be used. It should be noted that if using the soil / sand mix that "spoiled' substrate will not be obvious and a schedule of changing it will need to be set. In one corner of the environment a hardware store reflector clip light lamp should be positioned to provide artificial basking facilities. This should be positioned to provide a basking spot of 95 degrees F or so (35 degrees C) in that section of the habitat. The habitat should also be equipped with a full spectrum fluorescent light to provide for UVB. A UVB source is necessary for Vitamin D3 syntheses (needed in calcium metabolism). If preferred to this lighting arrangement a Mercury vapor bulb may be used that fulfills all requirements. There should be a hide box located in the corner away from the basking spot to allow the animal a cool dim retreat or enough hay to fully bury itself in serving the same purpose. The author has had excellent success with using both a mercury vapor light to provide UVB and daytime heat as well as a ceramic heat emitter on 24 hours over one end of a habitat to provide a temperature gradient. With both the light and the ceramic heat emitter mentioned above it is advised that one use a fixture with a ceramic fixture, as Mercury vapor bulbs and ceramic heat emitters are very hot, these should also be affixed in such a manner that they cannot contact the flammable substrate. With a setup such as the above the author has seen frequent breeding activity and outgoing, highly active tortoises. OUTDOORS HOUSING: Predator proof outdoor habitats offer many advantages over indoor accommodations and should seriously be considered as an option during warm weather if one lives in a low humidity climatic zone. Golden Greeks appear to be fairly cold tolerant but as mentioned earlier in this sheet cannot tolerate damp conditions. DIET: A high fiber, low protein and calcium rich diet will ensure good digestive tract function and smooth growth. Closely related Testudo fed on cat or dog foods frequently die from renal failure or from impacted bladder stones of solidified urates. There is no reason to presume that Golden Greeks would react otherwise. Avoid over reliance upon "supermarket" greens and fruits, which typically contain inadequate fiber levels and are too rich in sugar. While they need not be totally avoided, fruits should only be given as a very rare treat to this species as high sugar foods can cause diarrhea. Additional calcium supplementation is essential. Powdered calcium can be sprinkled all foods. It is suggested that the caregiver provide calcium supplemented with vitamin D3 if the animal is being maintained indoors and calcium without D3 if it is outdoors. Provision of a cuttlefish bone, which can be gnawed if desired, is also recommended. In addition to this, occasional use of a multi-vitamin / mineral preparation will insure that the animal gets needed supplements that may be lacking in a captive diet. The weight and fat reserves of this species would seem to indicate that it hibernates in cool weather or aestivates in very hot dry times. At the present time there is not enough information readily available to determine which it does or if it does both. The author would not recommend attempting to hibernate this species at the present time. 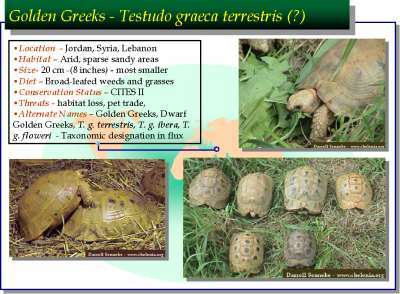 There are known Testudo graeca ibera variants from both Turkey2 that do hibernate and resemble Golden Greeks at first glance, but recent information puts the probable point of origin in the Jordan, Lebanon or Syria area. In this area winter is in the rainy season, with major precipitation falling after December. Rainfall is generous but is concentrated during only a few days of the rainy season, falling in heavy cloudbursts. The amount of rainfall varies greatly from one year to another. Occasionally, there are frosts during the winter, and about once every fifteen years a light powdering of snow falls as far south as Beirut. If this is indeed the point of origin then I would NOT hibernate these animals. Until the precise location of the wild population of these imports is pinpointed it is not suggested that a hibernation period be attempted. MEDICAL: Before purchase examine the mouth, nares (nostrils) and eyes of any wild caught tortoise. If the mouth is very pale or the tongue appears covered with a coating or plaque-like material, if there are bubbles coming from its nares or mouth, or its eyes are swollen shut do NOT purchase it. Even with aggressive medical intervention is such situations, the animal is unlikely to survive. It should be noted that EVERY Golden Greek tortoise that the author has seen has, upon importation, been very heavily parasitized, both with nematodes and protozoans. This situation must be addressed for the health and well being of the animal. If planning to work with these animals the cost of a visit to a veterinarian familiar with reptiles should be considered to be a part of the purchase price. Untreated animals typically succumb to diarrhea and its accompanying dehydration. While Golden Greeks respond well to both Panacur and Flagyl it should be noted that dosage information available on the Internet or in hobbyist books is often dated and potentially dangerous, please leave drug advice to trained professionals. Another medical problem seen with some frequency in this species is septicemia (bacteria in the bloodstream associated with severe disease) 3. This condition can present in a number of manners including swollen eyelids, decreased weight, depression, hemorrhagic (red) lesions in the scutes which are quite visible in this light colored species through the plastron scutes, anorexia, depression, ocular discharge, and in some cases small skin abscesses in multiple locations. Treatment in situations such as this needs to be quick as well as aggressive (fluids, antibiotics, other supportive measures). Bacterial organisms in the bloodstream will rapidly seed such well vascularized organs as the liver, lungs, intestines, and kidneys leading to severe damage and often death. The husbandry also needs to be ideal in such situations to provide a preferred optimal temperature zone to allow the immune system to work properly. Another problem which bears revisitation in this medical section is clear nasal discharge and bubbling from the nostrils. If the discharge is clear, this tends to be due to excessive humidity issues and dampness rather than an underlying medical problem. If the discharge is yellow and thick, this is a medical issue which needs to be dealt with with your veterinarian. Turtle and tortoise care research is ongoing. As new information becomes available we share this on the World Chelonian Trust web site at www.chelonia.org. Serious keepers find it to be a benefit to have the support of others who keep these species. Care is discussed in our free online email community, which may be joined from the web address above. Please contact us about the many benefits of becoming a member of the World Chelonian Trust. 1Testudo ibera is often referred to as Testudo graeca ibera - we have used T. graeca ibera here but if looking for more information, both names should be used in literature searches. 2January 2000 issue of Fachmagazin - uber Biologie, Haltung, Zucht und Artenschutz von Schildkroten - starting on page 4 and continuing through most of the magazine. "Die Schildkroten Griechenlands" by Hans Hersche.